The Frugal Burqueño: Share your Thanksgiving with Puye Cliffs ! Saving money in Albuquerque and beyond since 2011! Share your Thanksgiving with Puye Cliffs ! After Santa Clara Canyon was devastated in the 2000 wildfire, Puye Cliff Dwellings' site wasn't reopened to the public until 2009. 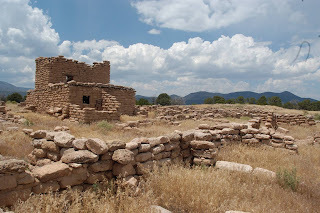 If you'd like to experience amazing cultural attractions (featuring cliffs, cave dwellings and early Pueblo architecture) how about a family tour? Starting this week they are running a Friends and Family promotion - 4 pack of Adventure Tour tickets for $100 (retail $35/person). The promotion will also be available for the Thanksgiving tour on November 24 (only one Adventure Tour at 10am). Reservations (until Nov. 23rd) - 888-320-5008 or 505-927-2731. The tour usually takes a little over two hours. They will have some feast cookies and pies to share with us :) We're going there on Black Friday so I'll be posting more! and if you bring your ticket stubs to KISS Coffee & Art 404 San Felipe St. NW you will get a FREE coffee! I write my blog with best intentions at heart. I post deals and contests the way I find them. Please always read the fine print for rules and details on the respective websites. I take your privacy very seriously. Please respect the copyrights of the images used on this blog. Thank you.